Successfully Added 6 Inch Car Subwoofer - 100W High Power Bass Amplifier to your Shopping Cart. 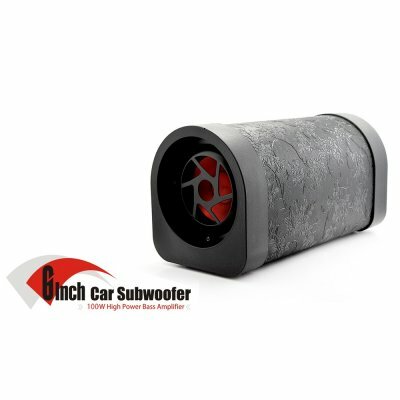 Experience bass like never before with this high efficiency, high output 6 Inch Car Subwoofer. Packing 100W of High Power Amplified Bass, you can finally give your car's stereo system a much needed audio boost and at a low, affordable price. There's no such thing as too loud for a car audio system and when you want to disturb the peace or just impress the girls, nothing does the better job than this 6 Inch Car Subwoofer. With the High Power Bass Amplifier, your car's puny stereo system can be amplified to blast up to 100W of booming sound that'll leave you and your car shaking with excitement. This 6 Inch Car Subwoofer is the ideal size for most passenger vehicles and can be installed instantly for bumping and rocking. Our advanced music lovers, however, are free to tweak around with the low input and high input, change frequencies (30Hz to 250Hz), and even use the LPF (low pass filter) to find that perfect sound. With full bass control, customizing and searching for your favorite sound isn't a chore - it's a pleasure. Part of the reason why we can offer so much performance for such a small cost is because we sell direct to our customers. No middleman eats half of your purchase and every cent goes into high performance and quality parts. Order now and start saving - brought to you by the leader in factory-direct electronics and car audio, Chinavasion. By how many watts will this subwoofer amplify my speakers?